Centrally located in Tryphena, 10 minutes drive from wharf and 15 minutes to Claris airport. Sensational fishing and numerous walking tracks abound on this paradise island. Stunning native birdlife and native bush. Safe swimming beaches a short walk away and surf beaches a 15 minute drive away. 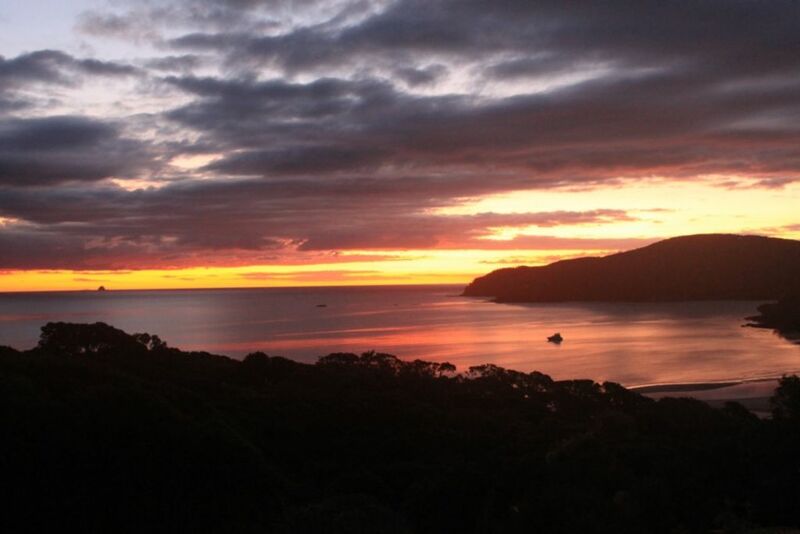 Watch the dolphins playing from your balcony with a glass of wine with the sun setting over the Hauraki Gulf. 300m to cafe, store and Irish pub. We had a lovely time on the island and Grahams place is an easy walk to cafe,shop and the Irish Pub. Graham was very helpful and looked after any concerns we had with transport etc. Just wish we could of stayed longer but we are already planning our return. Really enjoyed our stay here. The apartment had everything we needed for our time on the island. The location is perfect, just up the road from the local shop, bar and restaurant. The main feature however is the sunset views, we enjoyed having a drink every evening taking in the stunning setting. Graham is a really great host, very accommodating and friendly. Would love to come back one day! What a pleasure to have this couple stay, all the way from Isle of Man. Would be great to see you again. Graham was a great host, he picked us up from the ferry and made sure we had everything we needed. The accommodation is a flat under the main house and has everything a house should have - good shower and kitchen, power, spacious bedroom (with stunning morning views over the harbour) and comfortable seating in the lounge. The big glass sliding doors at the front of the lounge were perfect for watching the night sky in the evenings while being inside with a glass of wine. It is right by the Irish pub and a couple of beautiful beaches. We had a very pleasant swim (even though it was still October). A very pleasant stay, thanks Graham. Thanks for the stay Malcolm and for leaving the unit so tidy. Pleasure to have you stay and hope to see you again. The bach was in a perfect location with easy walks to shops and pub. The bach was in a perfect location with easy walks to shops and pub. The place was bright with a lovely view of the water and allowed a relaxing stay. Some fantastic walks are nearby but need car access to the starting points. We thoroughly enjoyed our stay. This is a magic spot. This is a magic spot. Perfectly positioned for sunset views with a glass of wine. Plenty of room for two people and is walking distance to the local Trypehna shops, beach and Irish bar. It has everything you need for a weekend away on the Great Barrier. We loved the classic Kiwi bach feel and can't wait to come back!